Select one of the following listed products to see the characteristics. The adhesive tape C105 HL is an integrated carry handle system made up of an adhesive backing with soft polyolefin foam. The wide range of available dimensions and printing colours meets any requirements. The adhesive tape C105 HL is an integrated carry handle system made up of an adhesive backing with high thickness soft polyolefin foam. The adhesive tape C105 HL consists of a neutral transparent tape with a printable integrated paper insert. 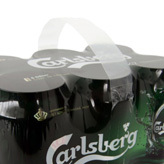 Thanks to its technical features it is the perfect solution for obtaining adhesive handles to carry heavy packages. It shows balanced adhesion, high mechanical resistance and inertness to oxidizing agents. C105 HL FLEXY consists of a transparent adhesive handle with a printable polypropylene insert to meet even the utmost demanding printing specifications. C105 HL CLEAR with integrated handle in transparent polypropylene. A discreet and elegant way to carry items with the aim to underline the uniqueness of the package. Thanks to its technical features the tape C105 S is the perfect solution for obtaining adhesive handles to carry heavy packages It shows high adhesion on thermoretraible PE film, special mechanical resistance and inertness to oxidizing agents. The coloured tape PP102 shows technical characteristics suitable for neutralizing the central adhesive part of carry-handles. It shows high mechanical resistance and low specific density, which makes it particularly light. It is a Polypropylene tape, which could be coloured or printed upon customer’s requirements. The polypropylene tape PP128 shows technical characteristics suitable for the neutralization of the central part of carry handles. It shows high mechanical resistance and being PP it is eco-compatible with the package. It is a polypropylene tape, which could be coloured or printed upon customer’s requirements. Paper rolls white or flexographic printed up to six colours. Paper labels for adhesive handles offset printed up to six colours. Manual dispenser for integrated adhesive handle, Alimac® C105 HL products range, on flat reel. Ideal for small productions, promotions or advertising campaigns. Manual dispenser for integrated adhesive handle, Alimac® C105 HL products range, on spooled reel. Ideal for small productions, promotions or advertising campaigns. The product C235 consists of a laminated 2 mm thick PE-foam. The lamination of the PE-foam can be done on several materials such paper (60 g/m3) or PE- film (60 My) or BOPP-film (40 My) and can be printed in several colours. Thanks to its technical characteristics the handle offers an extremely comfortable solution for the carrying of heavy packages. Copyright © 2019 - ALIMAC srl. All rights reserved.